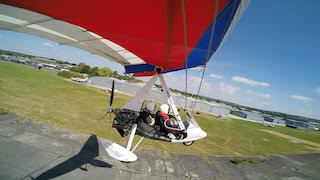 Learn to Fly operates P&M's hottest ship, the PulsR, the first fully composite trike for demonstration flights and aircraft sales. Appointed as a Main Agent for P & M Aviation in 2007, Learn to Fly has been established since 2002. 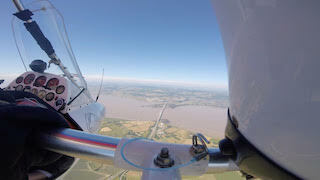 Flying the new PulsR to Isle of Wight 7th April 2019. 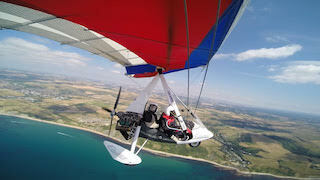 The PulsR offers a number of advantages to the conventional flex-wing. 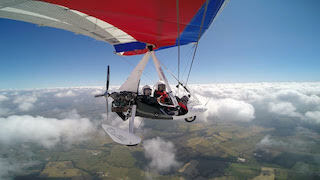 The composite trike is enclosed with a canopy design that keeps the occupants much warmer than a conventional trike. It is much wider and has fully adjustable seating, rear seat braking, roll trim and elctric pitch trim with fully slow airpseed around 50mph to fully fast 95mph. As a "grand tourer" this trike is hard to beat! Learn to Fly will be developing tour 'n train itineraries this summer (2019) with flights to Scotland, Ireland, France, Italy, Greece, Spain and Portugal.